Robert N. Charette of IEEE Spectrum, for his August article "The STEM Crisis Is A Myth." I think it's terribly important to address the STEM shortage myth issues from the IT/computers side, and Charette's article did just that. It has quotes from the usual suspects (the Ron Hiras and Michael Teitelbaums of the world), but it also pulls in a lot of serious policy analysis from RAND and other august institutions. A really helpful article, I thought. For the second year in a row, Sophie Rovner, Susan Ainsworth and Linda Wang of Chemical and Engineering News for their tireless coverage of chemist employment and unemployment. I really liked Sophie Rovner's article in the Employment Outlook edition this year, probably more than I expressed on the blog at the time. I'm planning on returning to this article, especially as 2014 progresses. These reporters have a much bigger microphone than I do. I tend to yell at reporters when they get things wrong; it makes me happy when I feel that writers and reporters get things right. 2013 was a weird year, especially with all the rumblings about hiring at the same time as actual layoffs increased. Best wishes to all of us for a less-weird, more happy new year in 2014. Talk to you then. I would be remiss in not mentioning that yesterday marked the 5-year anniversary of the fire that ultimately killed Sheharbano (Sheri) Sangji while she was transferring t-butyllithium in the laboratory of Professor Patrick Harran at UCLA. Stay safe in the lab, folks. Over the break, I read this account of scientists at the South Pole and a mysterious death from methanol poisoning that happened in 2000. As someone who's not much of a drinker, South Pole scientists' reliance on alcohol is remarkable, in terms of volume. That said, it's certainly understandable. Hard to say why Rodney Marks died; the article doesn't shed much light on it, other than a potential that Dr. Marks purchased a bottle of methanol-spiked alcohol from another country and brought it with him. An interesting story, for those who are looking for a longer article to read. 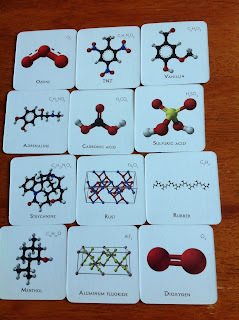 I thought this gift of 3-D printed molecules was nice. C&EN's year-end issue, lots of good stuff in there. LOLmythesis is funny, a good time waster. On an unrelated note, congratulations to Professor Paul Bracher, who got married over the weekend. Best wishes to the happy couple. I don't know why, but I was tempted by this memory game, highlighted by the Newscripts team at C&EN. I suggested it to my wife, and lo! Here it is on my coffee table. Very fun. Merry Christmas, everyone. Thanks for another great year. Here's wishing that you are at home with your loved ones, resting and not thinking too too much about chemistry. This Quartz piece on the misadventures of a battery/electrochemistry startup that worked with GM on some of the technology for the Volt is pretty interesting. Seems to me that the GM side was quite new to battery chemistry and did not know the right questions to ask or specifications to set. One little detail I really liked from the story was the posed picture of the two managers from Envia. 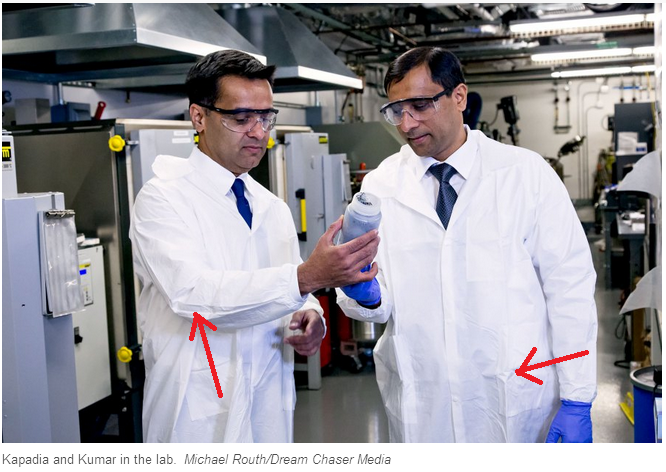 Of course, it's a posed picture, but the best part is the creases in the brand-new-from-the-wrapper paper lab coats that they decided that both folks should wear. As a public service to chemistry graduate students everywhere, I'm rerunning this post. (It's been updated.) Feel free to e-mail/print out and give to your family. After shutting down CNS in US, Biocon Bristol Myers-Squibb Research Centre (BBRC) Bangalore, India has laid off about 30% of its work force in medicinal chemistry including the director. This centre was CNS centric, most of the work was on CNS diseases. Anyone else have a similar story to report? 7. Invest in your own employees. The biomedical industrial complex has educated lots of young graduate students and postdocs over the past decade, during the boom in NIH funding from the late-90s to the early 2000s. Many of these people are stuck with no job prospects, because they can’t get the precious few faculty gigs at cash-strapped universities, and most haven’t gotten all the training and mentoring they need to be relevant for jobs in industry. Ethan Perlstein, a former Princeton University postdoc who struck out recently on his own as an independent scientist, has referred to this phenomenon as the “postdocalypse.” This is a huge recruiting opportunity for pharma, to snap up lots of bright people at entry and mid-levels and train them for long careers in industry. Instead, you just see wave after wave of layoffs in R&D, as companies seem to be almost throwing in the towel on all their good medicinal chemists, molecular biologists, biochemists, and more. It’s short-sighted, and unfair to those people. This isn’t a poverty-stricken industry like my former world of newspapers, which can’t afford to hire people. Pharma can and should do this for its long-term survival. Process Wednesday: Stupid reactor cleaning solvents! 9. The pilot plant results were identical to those in the lab. 10. However, on plant-scale, the Grignard reaction could not be initiated. 11. Back in the lab, it was demonstrated that small quantities of acetone are the real cause of this Grignard initiation problem. 12. Acetone was a cleaning solvent, frequently used to dry reactors, condensers and piping. Usually final traces of this solvent could be removed by applying vacuum on various equipment sections. I can only imagine the irritation of the chemists upon learning of this stumbling block. Grignard initiation on plant scale can be tricky and potentially quite dangerous (in terms of adding a bunch of halide and magnesium together that might react all-at-once and spray hot flammable solvent out of the rupture disk.) I've heard of SOPs where a verifiable initiation (as measured by exotherm or other in-process check) must take place before the full quantity of halide can be added. *Sadly, Dr. Hulshof's passing was noted in OPRD recently. I don't find this particularly helpful, but maybe that's just me. Professional Science Master's in Chemistry? Does anyone have experience with Professional Science Master's Degrees in chemistry? There are 11 programs listed on the PSM degree website for chemistry: Case Western Reserve University, Illinois Institute of Technology, Indiana University of Pennsylvania, Missouri Western State University, Rutgers, The State University of New Jersey-New Brunswick, State University of New York at Buffalo, State University of New York at Oswego, Stony Brook University, Temple University, University of Massachusetts Lowell, University of North Texas. Have you heard of any graduates of these programs? How are they fairing? Do these programs charge their students tuition, or is tuition paid for by company, or through the TA/RA route like more academic master's programs? What are these programs' track records in placing their graduates? Do they track their employment histories? Good morning! Between December 12 and December 16, there were 65 new positions posted on the C&EN Jobs website. Of these, 15 (23%) were academically connected. 34 positions (52%) were from Kelly Scientific Resources. Lake Zurich, IL: Fenwal is looking for a B.S./M.S. analytical chemist with ICP experience. Rolla, MO: Brewer Science is looking for a B.S.-level analytical chemist. At its Springfield, MO site, Brewer is also looking for a Ph.D.-level analytical chemist. Newark, DE: Lightwave Logic is hiring an experienced organic chemist to synthesize new dye chromophores. San Luis Obispo: Cal Poly-San Luis Obispo is hiring two assistant professors of wine chemistry. I have no idea what a world-class program in wine chemistry is, but I'd sure like to find out. Danbury, CT: Western Connecticut State University is hiring an assistant professor of organic chemistry. Houston, TX: The University of Houston desires an assistant professor of synthetic inorganic chemistry. Atlanta, GA: Oglethorpe University is also looking for an assistant professor of organic chemistry. Athens, GA: The University of Georgia needs an NMR manager. Dartmouth, MA: ...as does the University of Massachusetts-Dartmouth. If you see Richard Kiel, run: Osaka University is hiring assistant professors for the "Frontier Research Base for Global Young Researchers." Sounds like something from a James Bond movie. It'd be interesting to see the gender differences for the "further study" (i.e. postdocs) category, as well as the "employment" category. I wonder if there's a difference in self-reporting with men and women? Hmmmmmm. It's definitely worth your time. In the same article, C&EN incorrectly characterized Pfizer’s medicinal chemistry hiring plans. Pfizer is looking to enhance its in-house synthetic organic chemical capabilities to complement the talents of its contract research partners. The goal is to build internal synthetic problem solving for particularly challenging molecules. ...In June, the biotechnology firm Affymax auctioned off pharmaceutical equipment at its Palo Alto, Calif., facility, raising $1.4 million. Earlier in the year, Affymax recalled its only product, a drug to treat anemia. The company announced it would restructure itself and might declare bankruptcy. Idle equipment from firms such as Hoku and Affymax was once likely destined for the scrapyard or a ship bound for China, but these days it may end up back on U.S. production lines. Used equipment dealers are anticipating a resurgence in U.S.-based manufacturing brought on by cheap energy and raw materials derived from shale gas. Right now, dealers have huge inventories of unused plants and equipment. Although some of that inventory comes from recent bankruptcies or business reversals, even more idle equipment is sitting around because of mergers and industry consolidations, some of those going back to the Great Recession of 2008.
International Process Plants, which buys petrochemical, pharmaceutical, fertilizer, and oil-refining plants, owns 100 complete process plants for sale, according to IPP President Ronald H. Gale. IPP’s inventory includes methanol, hydrogen, polyester, and polyethylene facilities. Until recently, a lot of used plants and equipment went from the U.S. and Europe to buyers in the developing world, Gale says. But low-cost U.S. natural gas is beginning to change the flow of asset purchases. In what he hopes may be a harbinger of things to come, Gale says some used plants and equipment are being shipped to the U.S. from overseas. His firm recently sold a pharmaceutical-grade glycerin purification plant in the U.K. to a customer who relocated it to the U.S. But the cost of moving large equipment over long distances can be high. Gale is counting on the planned buildup of shale-gas-fueled petrochemical facilities by firms such as Dow Chemical, Shell Chemicals, and Braskem to drive up U.S. demand for some of the downstream plants that IPP owns. If I had all the time in the world, I would keep track of this more closely than I do. It's always interesting to me, the secondary markets in used equipment. Quintus comments on the filibuvir papers. Over at Chemistry Blog, chemistry Advent poems. John has goofy thoughts about plastic bags. Vittorio is very clever with his TLCs. This post about trailing spouses by @belehaa was really thought-provoking. Kilomentor moved a while back to a new site; still posting! I really enjoyed Deborah Blum's thoughts about Yasser Arafat and polonium. Jess' top 10 chemistry papers of 2013. Did you know there's a German chemistry job blogger? You do now! Chad Jones does really good chemistry podcasts; his interview with Carmen Drahl and his sons were both worth a listen. Did I miss anything? Put it in the comments. Have a great weekend! "Civility and Legality in Hiring"
11. How often should you communicate with candidates waiting to hear from you? What information should you provide? After spirited discussion, the consensus of the group was that you should tell your candidates as much as possible, as often as possible. Applications should be acknowledged, and if possible candidates should be told when their files are complete, or, as the deadline approaches, what they are missing. Then comes the waiting game: we have all been through this process, and we know that the hardest part is waiting around for someone to tell you what is happening. The group concluded that every time a decision is made, all active candidates should be told about it. When you make the first selection from 100 down to 15, you should tell the 15 that they are in the top 15, and the rest that they are not (I have made up these numbers, and do not mean to imply that there is any correct number or size of cuts). Note that this does not constitute rejection, and the communication should carefully say so, but on the other hand it is clearly exceedingly rare for someone who does not make the top 15 to eventually receive an offer. When you get down to six, the other nine should be told that they are not in the top six, and so on. Most places interview three candidates in the first round. During the interview, it is appropriate to tell the candidates when you expect a decision to be made, and when that day comes, contact the candidates! If the decision was not made, say so; if it was, go ahead, tell them what it was. Tell them if the decision is in the hands of the VP. Tell them what your recommendation to the VP was. If an offer is out, tell them when the first candidate has to respond, and tell them when the first candidate does respond. If you know who is second and third, tell them. If you don’t, tell them that! When you get a verbal commitment, tell the others. Young faculty in the room all agreed that they would want to know that there was an offer out to someone else, but that there was not yet a response, and there was certainly a chance of a “no” answer at which point they were next in line, etc. There was no suggestion from the group that this policy would make a candidate less likely to accept an offer if one came later. Quite the contrary, some believed they would be more likely to accept an offer, because the communication suggested an open and fair department and institution. The unanimous opinion of the group was that all aspects of the search should be conducted with the maximum possible openness. Candidates will feel positively towards a department that is open with them, and increasingly negative towards a department that leaves them dangling for long periods of time. We realize that we have recommended a lot of communication, which would be very expensive in time and money if done by letter. But e-mail lists work great for updating applicants on their status, and it is free (for now!). However, remember our earlier admonition: e-mail is not private. The candidate may not appreciate an electronic status update. The point is, do the best you can to keep applicants informed of progress; we see no point in hiding information. The article was published in 1998 and aimed at faculty positions. I think keeping people informed as much as possible is pretty wonderful; it's a real shame that it doesn't happen more often. In the great day when I'll hold sway over hiring (this is after the Cubs win their 3rd back-to-back World Series), I'll plan to stick to this. 1. “Civility and Legality in Hiring,” Reingold, I. D., CUR Quarterly 1999, 19, 180. How to break into venture capital and the like? I am sure there are Ph.D. chemists in the field -- one of my first fun posts was tracking down the factlet that 25% of Harvard's chemistry Ph.D. class between 2005 and 2008 ended up in business/finance of some sort. The big management consulting firms (the McKinseys of the world, etc) are still hiring, and still hiring new Ph.D. graduates, right? Probably from top-tier programs? What do you do all day if you're in venture capital? I assume that you're constantly sifting through proposals from various people, looking for organizations that have a good idea that might make money. What entry-level positions in private equity firms would be relevant for new Ph.D. grads? Readers, any thoughts? Much appreciated. The ACS - in cooperation with The Northeastern Section of the American Chemical Society, the ACS Small Chemical Businesses Division, and the Nova Biomedical Corporation - is sponsoring a one-day business competition with a cash prize for the winning pitch delivered to investors and potential commercial partners on Wednesday, April 9, 2014 at the headquarters of Nova Biomedical Corporation at 200 Prospect Street, Waltham MA, 02454. Entrepreneurial candidates must be ACS members and have an early-stage chemistry based startup that is investor ready. To qualify for participation in this business competition, candidates must complete our investor readiness survey. Access the survey here. Survey closes January 20, 2014. Note: There are only 20 slots available. Candidates who are selected for participation will work with an assigned mentor to develop a winning pitch. Details are here, here and here. It seems to me that this is one of those things where you should think about entering, even if you're not sure you're ready. Best wishes! We are looking for a West Coast junior life scientist who can travel the country to evangelize the use of Spotfire in R&D and clinical lifescience organizations. We probably want someone with a bio more than a chem background but his would be an interesting opportunity for a lifescientist looking for a different career. The ideal candidate will have a background in life science research, either in discovery, pre-clinical, clinical or translational research, ideally within an industry setting. A broad understanding of the processes involved in clinical and/or translational research would be an advantage. They will be familiar with creating and authoring visualizations on the Tibco Spotfire platform to progress life science research. Prior experience with other Enterprise scientific software such as E-Notebook, LIMS, Columbus, Empower, R, SAS, etc. would be a plus. See here for details. E-mail Philip at philip.skinner -at- perkinelmer.com if you're interested. Good morning! Between December 10 and December 11, there were 36 new positions posted on the C&EN Jobs website. Of these, 19 (53%) were academically connected and 14 (38) were from Kelly Scientific Resources. Not much, really: Kelly positions and academic slots. Sigh. Blacklight Power! : Blacklight Power will post jobs everyonce in a while; they're looking for a senior mechanical engineer. For more information on this rather dubious organization, see Derek Lowe's posts. Huh: I'm probably going to cover this in next week's IFF, but Shenzhen University is hiring a crap ton of professors (30 openings), some for chemistry. Shenzhen isn't a very nice part of China, but it likely is very exciting to be there. 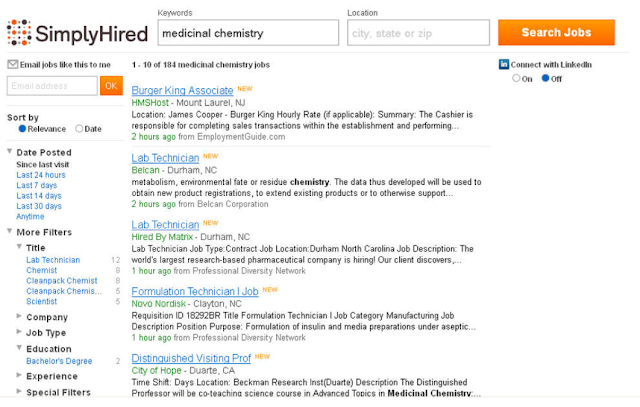 A broader look: Monster, Careerbuilder, Indeed and USAjobs.gov show (respectively) 206, 700, 2593 and 19 positions for the search term "chemist." LinkedIn shows 149 positions for the job title "chemist", with 12 for "research chemist", 19 for "analytical chemist", 3 for "organic chemist" and 1 for "synthetic chemist." Think of the transferrable skills! Network to your next position! How do you stop high school chemistry demonstration accidents? Like Jyllian, it seems to me that there are a lot of alcohol fires reported in school settings (as crudely measured by Jyllian's chemical safety roundups.) I wish I knew how I could help the situation; by putting this on YouTube, it seems like CSB has put their best foot forward. There's a lot of great things that can come out of high school chemistry demonstrations. My high school chemistry teachers would put on the classic flame/explosion show (magnesium/dry ice, hydrogen balloons, they did a thermite reaction one year) and it was freakin' awesome. I loved it. They managed to do things the right way; they were fairly serious about safety (PPE for them, keeping us a fair distance away). In the case in the video, there wasn't an adequate enough amount of administrative supervision. There never is, I suppose. How to prevent a Western Reserve-type accident (or another bugaboo, the exploding nitric acid waste bottle) from happening? I don't know, but I'd sure like to try. We also observed a source-dependence for the LHMDS, similar to that observed with the oxazolidinone substrate. (CJ's note: the authors had an oxazolidinone in place of the ethyl ester in structure 23 in a previous route.) With LHMDS prepared from n-BuLi and HN(TMS)2 the yield was consistently 88−90%. However, in the case of one supplier using a lithium metal process (Li metal, 2-methyl-1,3-butadiene, HN(TMS)2), a consistently lower yield of 81% was observed. Similar observations with LDA prepared from n-BuLi vs Li metal/styrene have also been reported. In the course of investigating the cause of this variation, we identified two additional suppliers who used the lithium metal process, but with those sources the higher yield was consistently obtained (88−90%). We also found that if the “low olefin content” grade of LHMDS was used from the initial supplier, the yield improved to 85−87%. We studied several potential culprits, including the presence of residual 2-methyl-2-butene and small quantities of other metal contaminants (e.g., sodium amide bases, LiCl, and Li-alkoxides), but none of these accounted for the observed discrepancy. In all cases where the yield decreased, an increased level of elimination impurities was observed (i.e., the total mass balance was consistent). 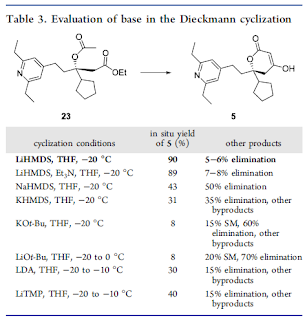 While these results continue to intrigue us, our successful identification of at least three viable commercial suppliers (Optima, BASF, and Chemetall “Low Olefin Content” LHMDS) for the reagent and the relatively modest yield variations have attenuated our concern with this unexplained LHMDS source variation. The two elimination pathways are shown in Scheme 6. The first involves elimination of acetic acid from the cyclization substrate 24, to form a mixture of acrylamides 28. An E1CB mechanism via the lithium enolate is shown, but this could also proceed through an E2 elimination in the presence of a weaker base such as the lithiated oxazolidinone generated during the cyclization. The second pathway is a ring-opening elimination of the β-keto lactone product to generate a β-keto acid, which undergoes decarboxylation to generate a mixture of enone isomers 29. The top elimination pathway predominates in “normal addition” mode, i.e. addition of LHMDS to the substrate. We estimate the pKa values of the relevant protons at ∼25 for C3′ and ∼23 for C2. 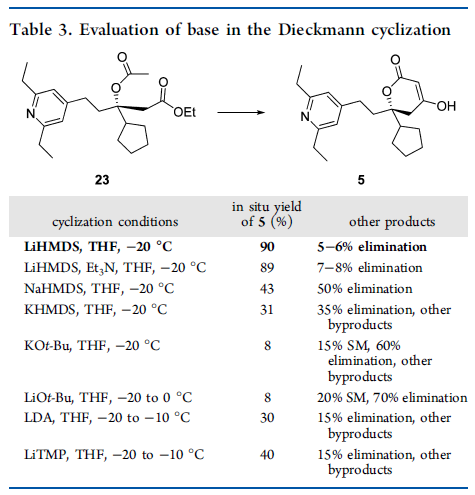 The use of a strong, hindered base such as LHMDS and the low reaction temperature (−20 °C) favor kinetic deprotonation at the more sterically accessible position (C3′). Nonetheless, direct enolization at C2 remains a possibility, and intramolecular proton transfer from the desired C3′ enolate to C2 is also feasible. I don't have any good answers for their questions either. Why would the method of preparation of LiHMDS matter? What is in there that is promoting elimination? Why is potassium and lithium tert-butoxide much worse? Readers, any ideas? Between December 5 and December 9, there were 51 positions posted on the C&EN Jobs website. Of these, 14 (27%) were academically connected and 31 (61%) were from Kelly Scientific Resources. South San Francisco, CA: Genentech is looking for a B.S./M.S. research associate in drug delivery; chemical and polymer synthesis experience desired. Ph.D. + 4 years specific experience in a chemistry related field in the pharmaceutical or API manufacturing industry; MS +7 years specific experience in a chemistry related field in the pharmaceutical or API manufacturing industry; or BS + 9 years specific experience in a chemistry related field in the pharmaceutical or API manufacturing industry. Ph.D. strongly preferred. Must be willing to travel up to 20%. Provides expertise in the acquisition and interpretations of data using analytical chemistry tools including: FTIR, TOC, LIBS, ICP-MS, etc. BS/MS in Chemistry desired. Huh. Did not know they hired chemists. Huh: I'm surprised that positions for tenure-track positions are still being posted. Raleigh, NC: I confess I wasn't aware of a College of Textiles, but they're hiring an assistant professor of analytical chemistry for it. Irvine, CA: Chapman University is setting up a School of Pharmacy; looks like they're looking for assistant professors to staff it. Pharmacy degrees desired, among others. The Ulsan National Institute of Science and Technology (UNIST) and the Institute for Basic Science (IBS) are proud to announce the establishment of “The Center for Multidimensional Carbon Materials” (CMCM) in Ulsan, South Korea. A primary objective of the Center is to design and develop the next generation carbon materials, and a prominent chemist is needed to lead synthetic and characterization efforts. Multidimensional carbon! A clever scifi writer could come up with a good story around that. Charlottesville, VA: An astrochemistry research scientist position is being offered at the University of Virginia. It sounds complicated, for sure. (Note that it requires an astrochemistry postdoc.) Another one of these formal-ads-that-aren't-really-ads? Probably. Busy this morning, but for your consumption, the latest data from the Survey of Earned Doctorates for 2012. Things look about the same as 2011, but still a little grim. Here's the data for employment for chemistry PhDs. Sure looks to me like the modal outcome of a chemistry PhD is a postdoc. The latest #chemjobs frontier: medical marijuana testing? If you'll forgive me for donning my political pundit hat for a brief moment, it seems to me that we are much closer to something akin to legislatively-driven federal marijuana decriminalization than we were 10 years ago. With that in mind, it seems that analytical testing of marijuana is a growth field and something that just might employ more chemists 10 or 20 years from now than it does today. There's going to be a raft of new regulation to go around it, which will be interesting. What is marijuana? A recreational drug? A pharmaceutical? If FDA gets involved, will we have cGMP cannabis farms? Will the pharma industry get into marijuana (doubt it.) Hmmmm. Are research scientists being replaced by mathematicians? The main front in data, however, continues to be “big data” in the laboratory. Information technology firms responded in 2013 with a new generation of electronic lab notebooks and other software for collecting, storing, and analyzing data in drug discovery and development. Drug firms are seeking statistical analysis skills in the lab. Some even claim that research positions once filled by scientists who are taught statistics on the job are now filled with mathematicians who learn the science in the lab. I would like to know, are there any recently-hired mathematicians working in bench-level (or bench-adjacent) positions in the life sciences industry, i.e. "a research position once filled by scientists"? I offer a shiny Sacagawea dollar to the first five people who can comment or privately e-mail me evidence of this (evidence being a verifiable LinkedIn profile). I am defining "mathematician" as someone whose terminal degree (B.S./M.S. or Ph.D.) was "mathematics." I am defining "recently hired" as "hired since January 1, 2010." I presume, though I do not know, that this is somehow related to this Ian Shott interview from earlier this year. Either way, a very interesting development. Rick Mullin's cover story is full of DOOOOOOOM for the pharma industry. I found this editorial by Roald Hoffman about a Middle East chemistry conference worthwhile and sad. Students doing molecular modeling in Syria in the middle of a civil war is just an awful picture. Carmen Drahl looks over the latest numbers from NSF on academic R&D spending from 2011; the chemical R&D spending rankings are interesting. The European chemical sector does not love Europe's higher energy prices. The boron out all reaction into the dry 2 L flask equipped with a large my next during bar is introduced 21.2 g 0.091 moles of the a slated oxazole the flask a sealed with a rubber septum and swept without you can solid is dissolved into hundred milliliters of anhydrous dichloromethane which is introduced via syringe. I thermometers inserted through the rubber septum and the contents of the Flasseur cool to 0°C with a nice bath to this cool solution is added via syringe 27 mL 0.107 moles of dibutyl boron true flight followed by 16.7 mL 0.1020 moles of triethylamine drop wise at such a rate as to keep the internal temperature below 3°C. The solution may turn slightly yellow or green during the dibutyl more Entre plate addiction and then to light yellow one triethylamine it's added the ice bath is then replaced with the dry ice chest that when the internal temperature drops below -65°C 10.3 mL 0.10 moles of freshly distilled benzaldehyde is added over a five minute. Via syringe the solution astir for 20 minutes in the drive sasktel bath then for one hour at icepack temperature. The reaction mixtures quenched by the addition of 100 mL of the pH 7 aqueous phosphate buffer and 300 mL of methanol to this Claudy solution is added by syringe 300 mL of a Toodle one methanol 30% aqueous hydrogen peroxide at such a rate as to keep the internal temperature below 10°C. the mother liquor is purified by flash chromatography column dimensions 8 x 20 cm with flash great silica gel. The mother liquor is purified by flash on Aleutian with 25% of lasted hexing additional 2.8 g 9% die Stermara leaps dais there you Merickel he pure material is obtained. I don't think Siri is quite ready yet to run a reaction in the lab, although perhaps I could use better diction. Have a great weekend! Toodle! What happens after you leave your on-site? What happens after a candidate leaves an on-site, and the overall impression is positive? Presumably, the chemists get together and nod and say, "Yeah, that's our guy/gal." Then what? Do they talk to the boss? How does HR get involved? Who holds the power, HR or "the boss", however he or she may be defined? What explains long delays that don't end in "No" after an on-site? Are long silences (without an outright "we are not hiring you") to do with money ("Do we have the money for this position? "), or that they're looking for another candidate? Should the candidate keep contacting the potential employer to remind them that they're still interested? What explains the change in hiring between modern times (2009-present) and the boom times of the late 1990s? Is it simply that the balance between employer and potential employee is so off-kilter that behavior that would be considered really rude/unkind is now de rigeur? I'd be curious to hear the opinions of hiring managers, or those who have participated in the hiring process. Fresh electrons from the Bureau of Labor Statistics: the National Unemployment Rate fell 0.3% in November to 7.0%. The broader U6 rate dropped 0.6% to 13.2%. 203,000 non-farm payroll jobs were added to the economy. The unemployment rate of college graduates was 3.4%, down 0.4% from October. The unemployment rate for non-high school graduates was 10.8%, down 0.1% from October. Employment in the chemical manufacturing subsector was up 2,200 jobs to 795,700 jobs. Revisions for September and October were relatively modest, with a total increase for those months of 8,000 positions. This looks like good news; the media may be focused on the labor-force participation rate and the employment/population ratio, both of which increased. How do readers handle it when senior chemist managers routinely give bad (as defined by irrelevant, against literature precedent or simply wrong-on-first-principles) chemistry advice? Ignore the bad advice. Keep doing what you're doing, show milestone success (however defined) and move on. Nod noncommittally at the bad advice, run a few experiments to placate the manager, keep doing what you're doing. Quiet, subtle resistance. Questions like "are there concerns about neighboring-group participation?" Open, direct confrontation. "I don't think that's correct, and here's why..."
Obviously, Tactic Four is to be deployed on a limited basis only. I'd like to hear reader experience and advice with these problems, if you have them. UPDATE: Before anyone trots out the old, old joke about Rule 1 and Rule 2, I note I've been there already. Love investing? Love to write? Love the healthcare industry and/or science? Then you might make a great contributor to our Motley Fool Freelance Network. To help you develop your analysis and writing to the point that you can earn a contract writing with Fool.com (a role that can mean more than $100,000 a year!). Together, we'll be helping the world invest better. Our Freelancers are encouraged to build a partnership with Fool.com editors and analysts and build expertise in financial analysis, storytelling, and the Foolish writing style that has served as the foundation of our company's success. We offer a pay structure that is clear, transparent, and, we hope, generous. If you write a post that is thoughtful, well-written, and makes specific and relevant mention of businesses and their tickers, we’ll publish it and pay you $50. If you develop a track record of high performance and if your posts are viewed as top-notch by our team at the Fool, you will be paid $100 per post. As many of our successful freelancers can attest, that might just be a starting point for your relationship with the Fool. We keep an eye out for the best writers and analysts -- those who truly work with us as partners -- and offer writer contracts to the best of the best. And that can lead to even bigger things. If you’re ready to get started, just head to http://fool.com/join and you’re on your way. If you have questions, shoot us an email at writeforhealthcare@fool.com. As most of you know, I'm not much of one for individual stock purchases. That said, I know plenty of my readers might be. Sounds like an interesting way to write about your investing hobby. Best of luck! Good morning! Between December 3 and December 4, there were 27 new positions posted on the C&EN Jobs website. Of these, 11 (41%) were academically connected and 7 (26%) were from Kelly Scientific Resources. Monroeville, PA: PPG is hiring an experienced Ph.D. synthetic organic chemist for a position working on optical materials. 3+ years industry experience desired. Cincinnati, OH: Well, that 55+ position B.S. 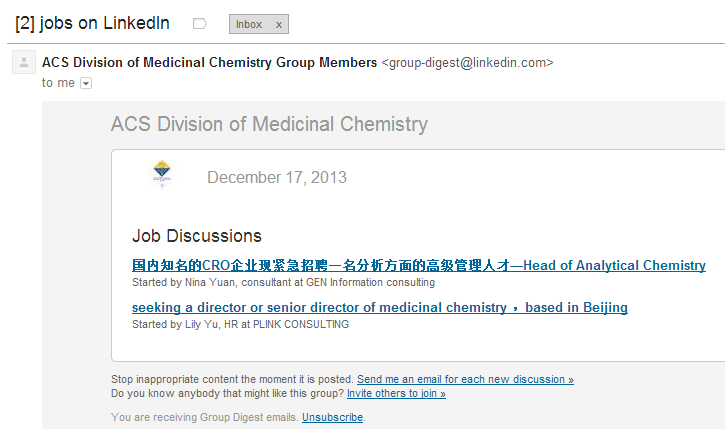 chemist position I was talking about a week or two ago was posted on C&EN Jobs. Do I see that correctly that it is for $12.72/hour? Oh, dear. Atlanta, GA: I have no idea what this UL technical manager position is about, although it probably has something to do with being an analytical chemist. Good luck! Cincinnati, OH: Procter and Gamble is looking for a Ph.D. analytical chemist to be its atomic spectroscopy group leader. Kelly Services is in need of Synthetic Organic Chemist to join the team at a top-tier agricultural company, located in the Indianapolis area. Requirements: Must have Bachelor’s degree in Chemistry, along with up to 10 years relevant experience in an industry or research setting OR Master’s degree in Chemistry and up to 5 years experience in an industry or research setting. Prefer experience with Discovery Chemistry, or heterocyclic chemistry. Most of the time, posting B.S./M.S. or "senior research associate" would be enough to stave off the Ph.D. resumes. 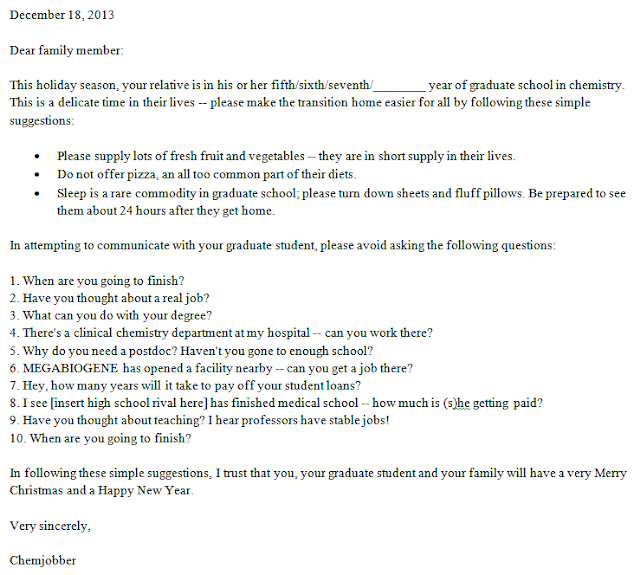 To me, this is more anecdotal evidence of a Ph.D. organic chemist surplus. If you're an ACS member, that means that you get 25 free downloads of documents from ACS Publications. Some people (like me) use some of them for work, some don't. The benefit runs out at the end of the year. Wouldn't it make sense for the benefit to carry over? Or, if not, wouldn't it make sense for a group of enterprising ACS members to congregate online and, say, burn through them before the end of the year? Just askin'. I was talking about this issue with a friend of mine, a brilliant PhD student in Electrical and Computer Engineering. We were walking by the quad during one of the big tech job fairs here at Purdue University, where some of the most powerful and profitable companies in science and technology come to entice Purdue students to apply for jobs. Purdue is a good school generally, but its reputation largely comes from its top-flight engineering and computer science programs. Looking at all of these billion-dollar companies spending time, money, and energy on developing elaborate booths, all to attract applications for employment, it was hard not to believe in the notion of a STEM shortage. When I mentioned that point to my friend, he laughed and said, “These companies are all trying to get the same 50 students.” This, more than anything, may be the source of the persistent STEM shortage myth: the inarguable value of being a star in a STEM field. There’s little doubt that people at the top of the food chain in computer science or electrical engineering or biomedical engineering, etc., often enjoy fantastic material and economic gain. But this is a banal point: it’s good to be a star. It’s good to be a star engineer in the same way it’s good to be a star musician or a star psychologist or a star writer. What public policy and politics demand is that we pay attention not to stars but to the median person. And the median American is facing a world of stagnant wages, the arbitrary nature of the employment market, and the constant fear of our financial system’s boom and bust cycle. The problem is that by definition, very few people get to be stars. I don’t doubt that the median Purdue STEM graduate is doing well. But Purdue is a top-flight STEM school, and half of our graduates will be below the median, and many who start those majors fail out of them, and the country is filled with schools who graduate STEM students who can’t get jobs. Basing our perception of the employment market on the outcomes of those 50 star students is pure folly. I think Freddie's friend is probably right -- all those companies aren't trying to get warm bodies, they're trying to get star students. I think we've seen this with (my old nemesis) and Dow CEO Andrew Liveris, who was commenting about paying new chemical engineers $120,000 a year. Let's leave aside the question of whether or not it was accurate; it's likely that Dow has the money to chase the new star graduate and pay them a top salary, whatever the number. I wonder if those CEOs and their minions see what they're paying their new people and say, salaries are going up! We must have a shortage! This doesn't excuse the behavior of the STEM shortage folks, but I wonder if it explains the nature of the distorted claims that they routinely make. The U.S. government has begun outfitting a ship in its reserve ready force with equipment to enable it to destroy some of Syria's chemical weapons at sea in the event Washington is asked to assist in the effort, a defense official said on Sunday. The Maritime Administration vessel MV Cape Ray is being equipped with the newly developed Field Deployable Hydrolysis System, which was designed by the Defense Department to neutralize components used in chemical weapons, a defense official said on condition of anonymity. The Organization for the Prohibition of Chemical Weapons, which supervising the disposal of Syria's chemical arms, said last week the United States had offered to destroy some of the components on a U.S. ship and was looking for a Mediterranean port where the work could be carried out. Say, what's that boat ship doing over there? Oh, it's just neutralizing chemical weapons. (Does a Pfaudler warranty for a titanium reactor cover saltwater exposure?) The Washington Post says that 2 of the units will be installed on the Cape Ray. UPDATE: The Guardian says that a Danish ship will be used to transfer the chemical weapons from the harbor to the Cape May. Wow. 1. The published procedure he was following was somewhat ambiguous, only specifying not to use a metal spatula, with no indication of the serious hazards of isolating the diazonium salt. While scraping the material on the fritted funnel with a Teflon spatula, the material exploded, leaving the chemist with multiple lacerations requiring sutures to mend and nerve damage requiring surgery to fix. (b) Complete a “Paper Assessment”: Consult literature, Bretherick’s,3 MSDSs. Consider reaction type, functional group instabilities, known hazards. (e) Submit completed “Reaction Review and Approval Form”. (f) Obtain approval from both one SAC (Scientific Advisory Committee) designee and one EPSE (Environmental and Process Safety Engineering) designee before performing the experiment. (1) After 3% of the acetate has been added, assay the batch for both consumption of starting material and formation of product (no quantitative assay was available for the intermediate). Do not add more acetate until confirming that the desired chemistry has been initiated. (2) Repeat after the addition of acetate is 10% complete, and again after it is 40% complete. (3) For deployment at pilot plant and manufacturing scale, investigate use of online instrumentation to monitor the reaction. reacts with many chemicals, thereby generating false positive or false negative results. I don't think our pans are aluminum, but I had not heard that aluminum pans can deliver false positives or negative. Huh. All in all, a worthwhile read. Ask CJ: How does a US-based B.S. chemist find a job in Germany? I am beginning my search for a chemical related job in Germany. I graduated with a B.S. in Chemistry from [a well-known state university in the U.S.], and will be graduating in May 2014 with a Masters in [field related to biomedicine, etc.] I have good analytical chemistry based research experience along with a very good working knowledge of how American hospital emergency departments work as I have worked in one for about a year. I am very committed to learning German, which I began about one month ago. Since I will be graduating with my masters in May of 2014, do you have any recommendations on how to search/find potential employees who will take me beginning around June 2014? I have been doing research on the internet, and have found a few jobs which want to hire immediately, but I have not found any information on how to find a job for a few months in advance. Where should I look for chemistry jobs in Germany? How far in advance can I apply for these jobs? I have a few questions of my own, the main one being: what is the experience of the readership in getting hired in chemistry in Germany? How does it work, being an non-German citizen? From the inbox, formulation chemist positions at Vive Crop Protection, a junior and a senior one. First position desires 3-5 years in the field, the second one requires a minimum of 5-8 years in a related field. We are looking for a Chemist – Formulations. The Chemist is part of the formulations research team and reports to a Senior Chemist and/or Team Lead. This position provides technical support of the company’s product development by conducting experiments, performing research and development activities and reporting on performance and results. This is a bench position helping development of new aqueous particle-based formulations of agricultural active ingredients. Click on the links above for the contact e-mails. Good luck! Good morning! Between November 26 and December 3, there were 48 new positions posted on the C&EN Jobs website. Of these, 26 (54%) were academically connected and 10 (21%) were from Kelly Scientific Resources. Seattle, WA: Seattle Genetics looking for a B.S./M.S. senior research associate in process chemistry, 3-8 years experience desired. Monroeville, PA: Axiall Corporation desires a Ph.D. inorganic chemist with 5-10 years experience for a Development Chemist II position; looks to be related to water treatment research. Makeup? : Cosmopolitan USA is looking for a consulting colloid/surface chemist; $75-150/hr consulting rate? Shamrock Technologies is back! : Not looking for a Scientist Friday this time, but still writing the ads floridly, desiring a lab tech. $35-45/hr, not bad. Next Glass, Inc. (www.nextglass.co), is a Wilmington, NC-based company developing a wine and beer recommendation engine application (think Pandora for wine and beer). The company is seeking a Senior Analytical Chemist excited about the prospect of creating methods for, and overseeing the testing of, 20,000+ plus bottles of wine and beer using a Thermo Fisher Benchtop Orbitrap Exactive LC-MS system, as well as other instruments. The Next Glass team loves hard-working team players who want to contribute to demystifying the wine and beer selection process! Compensation: We pay top-dollar salaries (competitive with the pharma industry for Analytical Chemists) to attract “A” players. The stock options aren’t bad either! Akron, OH: Looks like the University of Akron's college of polymer science and engineer is looking for a new dean. Wonder who they'll choose? Fairbanks, AK: The University of Alaska-Fairbanks desires two assistant professors of organic chemistry. Cookeville, TN: Tennessee Technical University, hiring an assistant professor of biochemistry. ست وظائف! : The Qatar University College of Arts and Sciences is hiring half a chemistry department, it seems, with plenty of lecturer and tenure-track positions. Good luck! After being laid off in 2010 from the pharmaceutical company Roche, where he had worked for nearly 14 years, Paul Oleas thought it would only be a matter of time before he found another permanent position. But after six months of searching, and no full-time opportunities in sight, the pharmaceutical chemist accepted a six-month contract position with MAP Pharmaceuticals. At the end of the contract, Oleas was offered a full-time position. His relief was short-lived, however, as the company was acquired by Allergan, and Oleas was laid off again. Within the American Chemical Society membership, roughly 3% of industrial members who responded to the 2013 ACS Comprehensive Salary & Employment Survey reported being in a temporary or fixed-term contract position (C&EN, Sept. 23, page 9). Although this percentage has stayed relatively flat in recent years, new graduates, with a current unemployment rate of more than 12%, may in fact experience a higher rate of temporary work, says Gareth Edwards, senior research associate in the ACS Research & Brand Strategy department. Gold says that five years ago, Fairway Consulting Group wasn’t involved in providing contractors, only full-time employees. Now, he says, filling these positions brings in 15–20% of the company’s revenue. Similarly, Marc Miller, senior director of medicinal and process chemistry at life sciences recruiting firm Klein Hersh International, has seen an uptick in contract and temporary hiring. Approximately 20–25% of the firm’s placements are for contract positions, and he anticipates that percentage will grow. “I think you’ll see it move toward almost a 50-50 split between permanent and contract hiring into 2014 and 2015,” he says. What is weird about contract positions is that my impression is that they are paid lower, not higher than full-time positions. You would think (and for some organization (i.e. hospital nurses), it is) that this would not be true, that the temps make more money to compensate them for taking on a more contingent position. That doesn't seem to be the case in the pharmaceutical industry, although perhaps I am wrong. The growth of a contingent workforce worries Erin Hatton, an assistant professor of sociology at the University at Buffalo, SUNY, and author of the book “The Temp Economy: From Kelly Girls to Permatemps in Postwar America.” “Not only do these jobs not offer any sense of job security, these jobs also pay lower wages and offer worse benefits,” she says. Quite so. Thanks to Linda for a worthwhile article, if a bit depressing. Best wishes to the permatemps, and to all of us. Worthwhile article by Celia Arnaud on pre-eclampsia early detection. Maureen Rouhi talks about Kennedy's moon shot speech -- I didn't realize how specific he got.